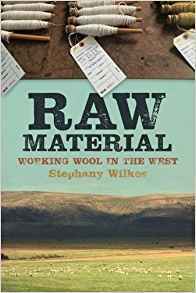 Stephany Wilkes is the author of the new book Raw Material: Working Wool in the West. Her work has appeared in a variety of publications, including The Billfold and The Ag Mag. 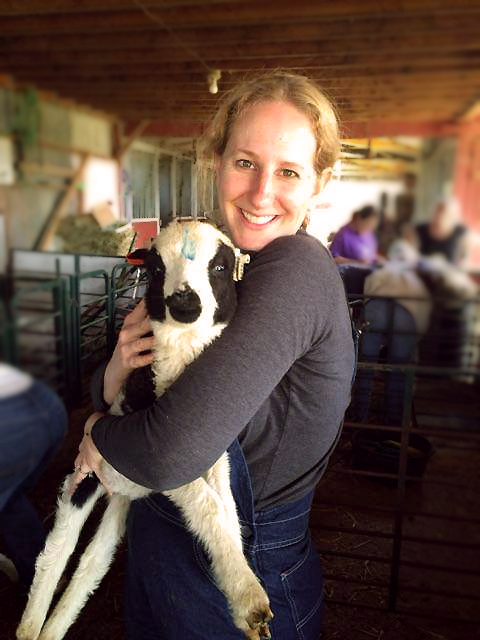 She is a certified sheep shearer, and she lives in San Francisco. Q: Why did you decide to write Raw Material, and how long did it take you to complete the book? A: I decided to write Raw Material for a few reasons. The first was easy and obvious: When I told stories about shearing, people said “You should write a book.” I had a lot of material to start with. I record a lot of voice notes, mostly while driving after shearing jobs, and always carry a little notebook. But the real, main reason — the one that kept me motivated — was that, while out working, I met many incredibly inspiring people, doing the most important work there is: sequestering carbon in soil, bringing natural fibers (instead of oil-based and toxic fabrics) into the world, reducing wildfire risk, removing the need for artifical fertilizers, stewarding rare breeds of sheep, and so much more. Their work was largely unseen and they did not get credit for it - the opposite, in fact, because ranchers and farmers are most often criticized and blamed for destroying the environment. I wanted the world to know about their work and the facts of it, and how many misconceptions we have about agriculture. It took me two years to complete the book (which spans four years), once I really focused on it. Those two years were followed by another year of refinement, editing, and figuring out what to do with the book. I workshopped sections of the book with writing groups, solicited draft manuscript readers, and took classes on how to write query letters and on the publishing process, which I knew absolutely nothing about. Q: The book includes information about the wool industry, but also about your own personal experiences. What did you see as the right balance between the two as you wrote the book? A: Like a lot of writers, I am an introvert. I spend a lot of time alone, in silence, and am happiest that way. Ideally, my personal experiences would not be in the book, and in early drafts they were not: I wasn’t in the book at all, and all of my subjects and wool industry information were. The original narrator was a nameless, strict third person voice, and the book was more journalistic nonfiction, no memoir. Omitting my personal story and voice proved distracting and confusing, so I begrudgingly put myself and more personal stories in the book. I still did not (do not) want the book to be primarily about me, so I kept my personal story to about one-third of the book, and (I hope) about two-thirds focused strongly on my subjects and their work. A: Most of the research is primary and field research, because I did it while working myself, in the field. I was talking to people while working, jotting down what they said, keeping voice notes, and interviewing many people by phone later. I showed my subjects what I wrote to make sure I reflected their experiences accurately. I also visited libraries and made use of various online sources, all of which are listed in my Notes section. Everything surprised me. Every new subject and experience, from vineyard management to lambing to soil science to wool mill permitting, was a surprise. My expectations always get a smack down from reality, which shows how off the mark they were in the first place, and that is always nice. One of the happiest surprises is the tremendous potential of managed grazing and carbon farming to mitigate climate change. The “4 per 1000” initiative, for example, states that an annual growth rate of just 0.4 percent in soil carbon stocks, or 4 percent per year, would halt the increase in the CO2 concentration in the atmosphere related to human activities. Global soils contain two to three times more carbon than the atmosphere, and there are 570 million farms in the world, so all of a sudden, taken altogether, tackling climate change—daunting because of how massive it seems—becomes straightforward, inexpensive, and strictly a matter of human will. We have the soil, and so much soil is already managed (in that it has people either grazing or tilling it, or both) that serious climate change mitigation really can be just a matter of shifting how we treat those soils. We’ve made a certain set of choices that brought us to this point, and we can make other ones. Related to this is another big surprise: That the people least suspected of saving the planet are doing the most important work, and far more than most of us. A: That it matters where our clothes come from, because the methods with which they are grown matter. The way the animals and land and human laborers are treated matter; it matters to all of us that they be non-toxic and compostable. And I really hope people get the sense that we can do things differently, that we are not stuck even if we feel stuck. Fast, cheap, toxic fashion is a phenomenon that did not exist (in its current form) 15-20 years ago, for example. When I was in college, people were not buying loads and loads of $9 pairs of jeans and $5 t-shirts. If fashion can change that quickly, we can change just as quickly again, in a different direction. A: Right this minute, I’m working on the index for Raw Material, and I just sent a pitch to The New York Times that will probably never receive a reply, like most of my pitches. More seriously, sophomore book syndrome is real. I function better as a writer (and in life) with a big, well defined project in front of me and I don’t yet have another one as well defined as Raw Material, so I feel a bit adrift. But, I have three completed short stories (fiction) that I’m shopping around, and I have more in draft. I am mulling the structure for my next book. It may be a collection of essays; I don’t know yet. I cut a lot from Raw Material (almost as many words as are in the final manuscript) about other fibers, people who do not work with wool, all sorts of subjects, so I’m playing with that. And I have at least two other nonfiction books I’d like to do, unrelated to fiber and shearing, subjects I stumbled across during research. I need to find the threads and arcs to follow, because these stories have visited and taken up residence in my mind, demanding attention. A: I cannot believe how long it took to write a book, and how hard it was. It is miraculous that any author writes a second.